In my previous post about Tropic, I said that I'd HAVE to try their makeup and here's that post! Tropic makeup is actually designed to benefit the skin - as well as being free from synthetic fragrances, harsh preservatives and parabens. The makeup is designed to accentuate your natural beauty and has vitamins, minerals and botanical extracts infused in the formulas. So, you can see the attraction for me! 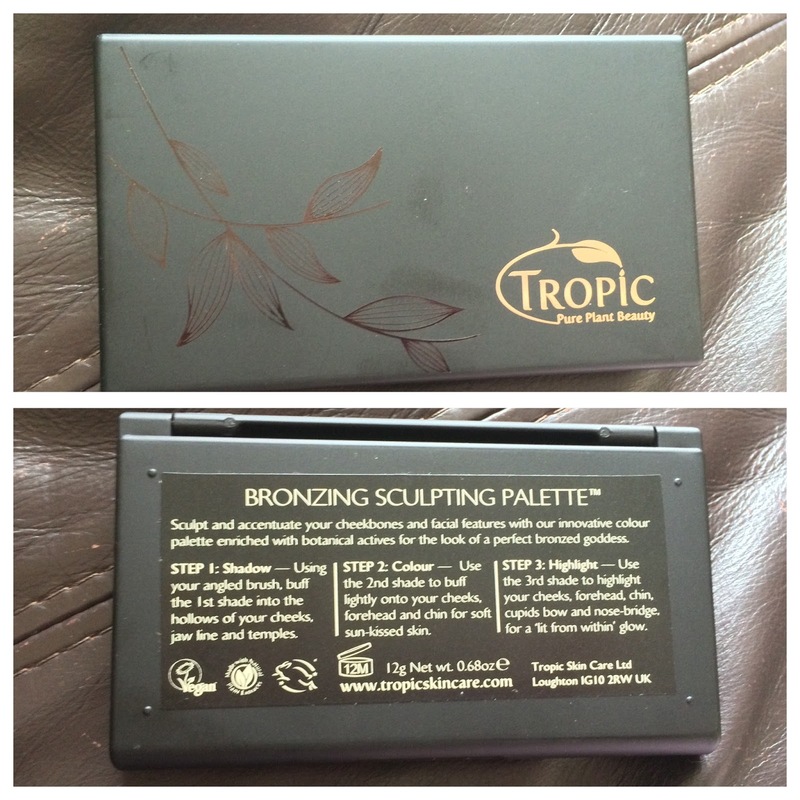 I love using natural products and Tropic skincare really impressed me so I had to give their makeup a go. I also tried Tropic's Blush Brush and O-M-G, it's superrrr soft! Like seriously I sat there stroking my face with this thing for way too long. It's actually made from 100% Organic Bamboo so it's amazing quality. The bristles are very densely packed so it applies makeup beautifully. This brush is seriously good, I will most definitely be investing in more Tropic brushes. The Tropic Colour Click Lipstick is super interesting and unique! The container has a mechanism whereby the lipstick 'clicks' into the outer packaging so it's secure. It's actually really funky - I spent at least 20 minutes playing with this. I love the look of the packaging in general, it's definitely easy to identify this as a high end makeup product. After I'd finished playing with the mechanism, I swatched the lipstick on my hand and was pretty gobsmacked at just how creamy the formula is! This is most likely due to the addition of Argan Oil, Avocado and Jojoba Oil. Such luxurious ingredients for a lipstick! I chose the colour 'Sweet Pea' which is a pretty vibrant pastel peachy pink colour as you will see from the swatch. I wore this lipstick to work and it stayed on from 7am til about 3pm so it has great lasting power considering that I ate my lunch during that time. 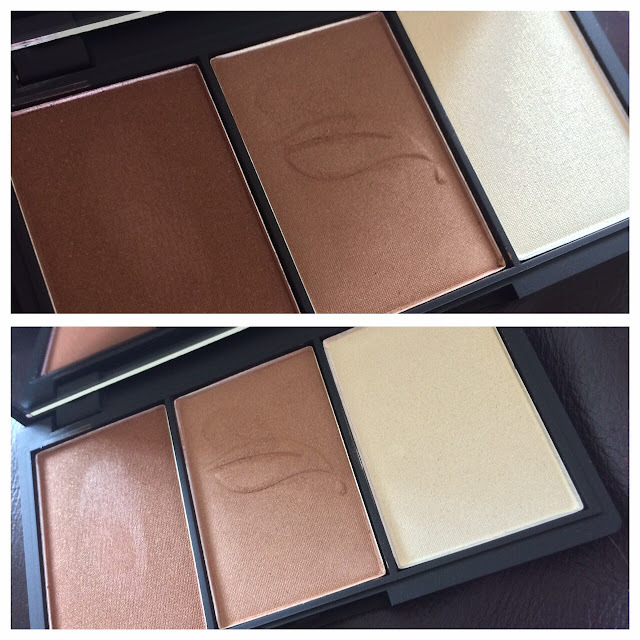 My favourite product that I received was the Sculpting Palette in Bronze. At first it reminded me of one of those contour palettes that every makeup brand is coming out with! But it's so much more than that. The shades of bronzer and highlighter really are beautiful to wear on their own or together and the products are so soft and pigmented. The powders are enriched with Vitamin C, Pomegranate Oil and Carrot Oil. 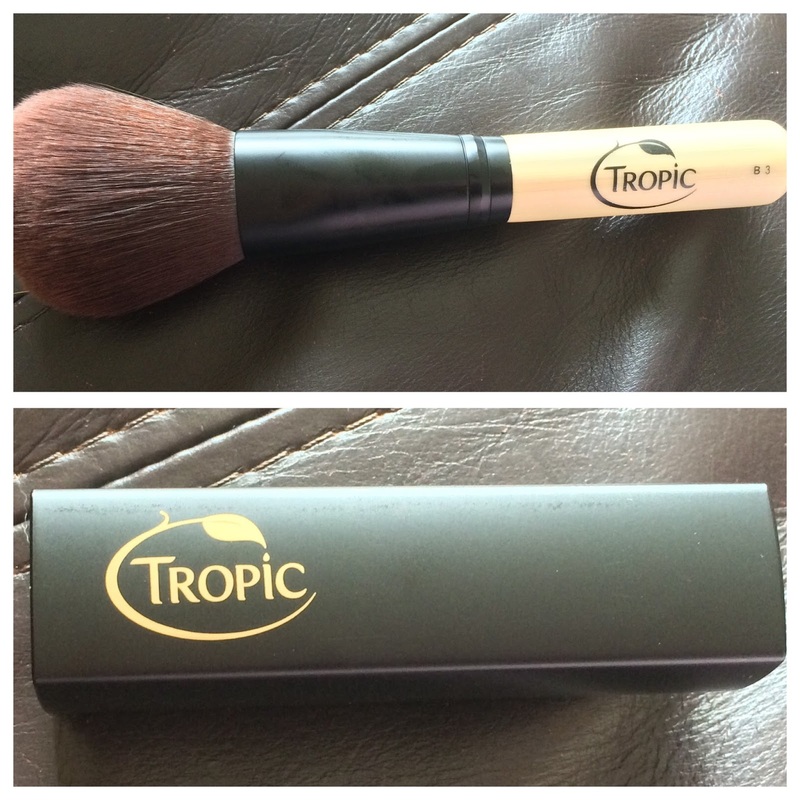 This gives the products a silky smooth feeling - they feel amazing when applied with the Tropic Blusher Brush!! 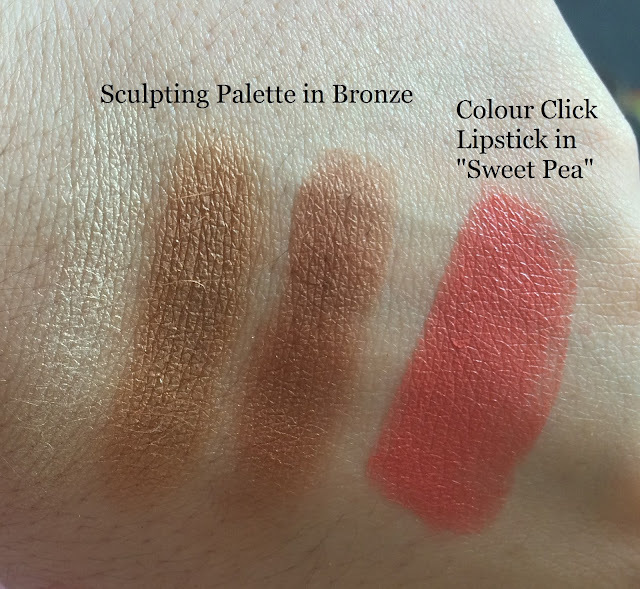 I was so impressed with the pigmentation of these colours, I washed my hands multiple times after swatching them and they didn't budge. Again, the packaging is beautiful and very robust. There's a mirror inside the palette so it's great to slip in your handbag - no need to bring an extra mirror then and you have all these beautiful shades with you! Definitely try out Tropic if you haven't already - their skincare and makeup is to die for. Check them out on Twitter and Facebook as well! £££: Bronzer Brush £18, Colour Click Lipstick £14, Sculpting Palette £24.